The Daleks is, as I'm sure you all know, the story that introduces us to The Doctor's most persistent and dangerous enemy. Although no one was to know that at the time. It's pretty clear that at the end of this story the Daleks are finished. These are a very different bunch to what is to come. Trapped inside a single city on Skaro because they can only move via static electricity on their metal floors these are not the galactic conquerors that they will become later. The impression you get is this is the fag end of the Daleks as a species but they do have that determination to survive, regardless of other people's intentions. They're not quite as extermination obsessed at the beginning of the story as they become later but that's partly because they're trying to get information from and convince The Doctor and his companions to help them. Once they don't need that help (and once the Doctor & co prove to be more of a pain in the arse than expected) then the 'real' Daleks reveal themselves. The story itself is surprisingly good over the course of the seven episodes. There are, naturally, moments of tedium but mostly it manages to keep the levels of tension up throughout. The first episode in particular is as good as the first episode of An Unearthly Child. The way Christopher Barry uses camera angles to emphasize the alien nature of the city feels like something out of German expressionist cinema. It helps you feel some of the discombobulation that Barbara feels as she's dragged further and further into the maze of the city. It all builds up to THAT cliffhanger at the end of Part One. Jacqueline Hill's reaction sells it. Something horrible is coming. And you really want to know what it is. No wonder people tuned in for the next episode. I should pause here to praise Raymond Cusick whose design helps make this story so memorable. The Dalek city is fabulous. And, of course, the Daleks themselves are one of the great pieces of design. Even now in 2015 with their tweaks they look fantastic. 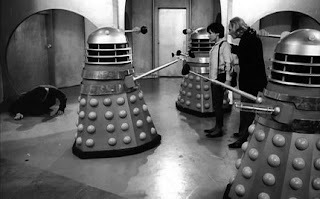 Even with the egg whisk and sink plunger jokes there is something sinister about a Dalek. Perhaps it is that - in the earlier stories - they are a little shorter than average height so you find yourself wondering how they got someone inside. Then there's the realization that there is an occupant. Cusick's contribution is one of the key reasons this story works as well as it does. The other is Nation's script itself. Whilst the dialogue rarely sets the world on fire the plot itself has the right level of drive. It feels like a high quality episode of one of those Saturday morning kids adventure serials like Flash Gordon or Buck Rogers. It's not spectacularly original but it does a job. The Daleks are - as we all know now - clearly drawing on Nazis. Indeed if you made the Daleks actual Nazis, made the Thals some non-first world humans and took the Doctor and friends out of it I reckon you could slot Indiana Jones into this. All it needs is the right mcguffin for everyone to be chasing. The Thals themselves are the contrast to the Daleks. Handsome, blonde and pacifist as a result of their history. They become the Doctor's allies after Ian convinces them to abandoned their pacifist ways. Indeed one of the most interesting scenes here is the conversations between the Doctor, Ian and Barbara about convincing the Thals to take up arms to help them recover their fluid link. And then Ian's attempt to draw violence out of Alydon (John Lee). It's all pretty obvious in some respects but is played with such sincerity as to feel 'deeper' than it is. The First Doctor's deviousness and childishness is to the fore here. He wants to explore the mysterious city. The rest of the crew won't let him. He sulks and then fakes a reason to do so. By pretending he needs to go down to the city to repair the fluid link. In the end, as a result of a lack of proper health and safety, this almost gets everyone killed by radiation poisoning. But actually by the end there is a more avuncular Doctor again talking to Alydon about being a 'pioneer once among his own people.' Hartnell's performance is excellent, although Part One does contain a number of fluffs and stumbles but I'm very forgiving of those. Jacqueline Hill (Barbara) and William Russell (Ian) are also strong. Russell gets lots to do. Lots. In some respects he's the lead character in this story, not The Doctor. Barbara even gets the first companion flirtation with Ganatus (Philip Bond), which in classic Doctor Who style is barely touched upon until the final episode. Carole Ann Ford (Susan) has moments - especially in the first two parts - but you can already tell that she's a character with problems. She's not really allowed to do much apart from be scared and protect her grandfather. You can see why she would want to leave. The Thals - whose names tend to become merged together and drift off - are played with various degrees of excellence. Philip Bond is clipped and buttoned up as Ganatus. Ganatus also gets to beat the Fifth Doctor to 'There should have been another way.' (Well, almost.) John Lee is solid and stentorian as Alydon. Marcus Hammond gets to do scared as Antodus and gets one of the stories bleaker moments. Jonathan Crane as Kristas gets to be one of the only two people I can think of that get hit by a Dalek ray and survives. The other being Ian. And in Ian's case the Daleks deliberately stun him. The weakest performance is probably Virginia Weatherall as Dyoni (who is the only female character apart from the main cast to actually speak). It might not entirely be her fault. She doesn't get a great deal to do. I'm sure I could say a lot more about this story but I've been waffling on for ages so I'll put you out of my misery. I like The Daleks. It's a good adventure story with real issues at the heart of it. It's pretty well-acted and directed. Could it be shorter? Probably. But sixties television is a very different beast to 2015. It's more theatrical (with exceptions) and slower. I'm not sure I'd recommend watching all seven episodes in one go. I spread them out over the course of a whole day, which I'm sure helped.